Laser ablation ICP-MS is a technique used for direct analysis of solid samples and is widely becoming a technique commonly used to measure trace elements in marine calcifiers. At UC-Davis, I helped develop the lab protocol for analyzing foraminifera and worked with students and other researchers to analyze trace elements in oysters, otoliths, speleothems, mussels, olivella shells, and tree cores. 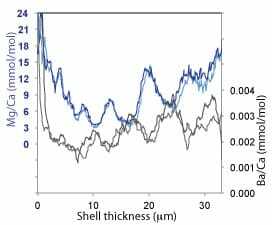 Below is an example of a laser ablation depth profile of a foram I analyzed using the LA-ICP-MS system at UCD. This is an amazing technique for linking growth conditions to shell geochemistry. For example, in the specimen below the foraminifer was grown in seawater with elevated Ba/Ca ratios (4x ambient) during the day and ambient seawater at night. By using a low repetition rate and low energy density we are even able to resolve thin inner calcite banding. These inner calcite Mg bands occur across a few microns of calcite. This shell was analyzed as part of a culture study where we modified light conditions to assess controls on the Mg/Ca banding in this species. Learn more about laser ablation techniques and why a 'foram standard' is useful for within and between analytical sessions here. We completed a project analyzing daily Mg-banding in N. dutertrei and have developed a new model for how this species adds calcite throughout its ontogeny.